James Vince made an unbeaten 90 and Adam Wheater a quickfire 51 as Hampshire amassed 204-3 after being put in to bat. Sussex looked on course to pull off an unlikely win when Chris Nash and Luke Wright put on 98 for the opening wicket inside ten overs. Nash fell for a career-best 88 in the 17th over but successive sixes from Craig Cachopa in the penultimate over got the equation down to ten from the last six balls. Former Sussex bowler Yasir Arafat came back to haunt his old club with a brilliant final over to restrict Sussex to 200-6. It means Hampshire can still secure a quarter-final spot if they win their final game against Somerset on Thursday while Sussex missed out on the chance of guaranteeing their progress. Vince and Wheater laid the platform for Hampshire’s biggest total for five years after Michael Carberry was well caught by Ollie Robinson off the bowling of Chris Liddle for 14. Wheater dominated a stand of 93 from 53 balls but could have been out without scoring as he survived a close run out appeal. The wicketkeeper pulled his fourth ball for six off Robinson and also cleared the ropes off the bowling of Will Beer and Liddle. He brought up his 50 with his fourth four off Chris Nash but was out the very next ball when he mistimed a pull and was caught at midwicket by Liddle. Wheater’s departure did not slow Hampshire’s momentum, however, as Owais Shah blasted a quickfire 40 in a stand of 72 from 36 balls. Vince also survived a scare when Robinson put a tough chance down on 41 and made the most of the reprieve. He brought up his 50 from 38 balls and a first Twenty20 century looked a possibility when he smashed Tymal Mills to move to 84 with two overs remaining. Sussex needed to make a quick start and in-form opening duo Nash and Wright provided it. Nash smashed Will Smith for two sixes in the opening over as the Sharks raced to 66-0 at the end of the powerplay. 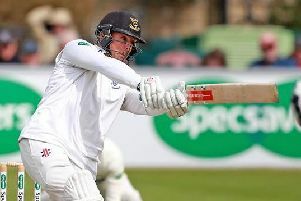 Nash brought up his 50 – from 28 balls – with a delightful inside out cover drive but was denied a third century partnership of the season with Wright when the Sussex skipper was bowled for 42 by Yasir Arafat. Sussex-born leg-spinner Mason Crane picked up the wicket of Matt Machan in the next over to swing the momentum back in Hampshire’s favour. A partnership of 65 from 39 balls between George Bailey and Nash kept Sussex very much in contention until both fell in the space of three balls. Nash holed out to former Sussex player Joe Gatting at long-on off Chris Wood for 88 and then Bailey was well caught right on the rope by Gatting for a 21-ball 33. Sussex needed 35 runs from 19 balls at that point but there hopes seemed to have disappeared when the equation became 22 from eight balls. Successive sixes from Cachopa off Wood got it down to ten from the final over but Arafat produced a brilliant final over to deny his old club.